My name is Lewis Bedford and I am playing cricket in Australia for the winter with Sydney University. On top of this, I am a youth ambassador for the Born Free Foundation. 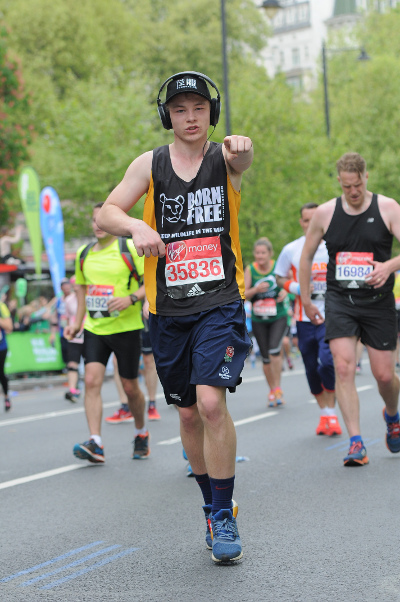 I have run the London Marathon around a year ago for the charity, which was the most amazing day. In addition to this, I raised in excess of £10,000 for the charity as the school charity representative. I have a passion for wildlife because of my wonderful Mother, who grew up in Zimbabwe. She instilled a passion by taking us on various trips into the wild and quickly taught us of all the intricacies of the wild. She is working in wildlife conservation, and it is inspirational to see how charities are making a difference in the wild world. They are the royalty of the savannah and face a challenging time in their existence, which is why I am so pleased Born Free support them in the ways they do. I wanted to become a Youth Ambassador to emphasise the need for youth interaction with wildlife conservation. As the youngest demographic, we serve a huge function to the futurity of wildlife protection, which is why we should begin to engage from a young age. Many of the great wild challenges will come to crux points during my peers and my working careers. I love the passion of the Born Free team - meeting them made me aware of just how dedicated every employee is, and that their roles are of huge importance, hence why they need our support. I endeavour to support the foundation by attending their events, rallies and offering my services in the research and journalistic fields in the future. My social media presence also helps engage their messages to my friends and family.